One-bedroom, one-bath, oceanfront condo. Here you will find spectacular views, breathtaking sunspaces, as well as an incredible marine display by our native Humpback Whales. Our centralized, yet tranquil location allows you to be involved with the many island activities, while still allowing you the relaxation you deserve in paradise. Enjoy the comforts of home; our unit includes a fully equipped kitchen, washing machine, dryer, television, Wi-Fi internet connection, free local and long-distance telephone (U.S. & Canada), free parking, and air conditioning. Also included, beach towels, tennis racquets, and putters! This condo sleeps 4. Relax on a king size bed in the Master bedroom, or wake up to the ocean on a queen size sleeper sofa in the front room. This unit is on the 3rd floor of the L Building and nothing will sit between you and the view of the ocean; it is one 1 of 3 truly oceanfront buildings at the Papakea. 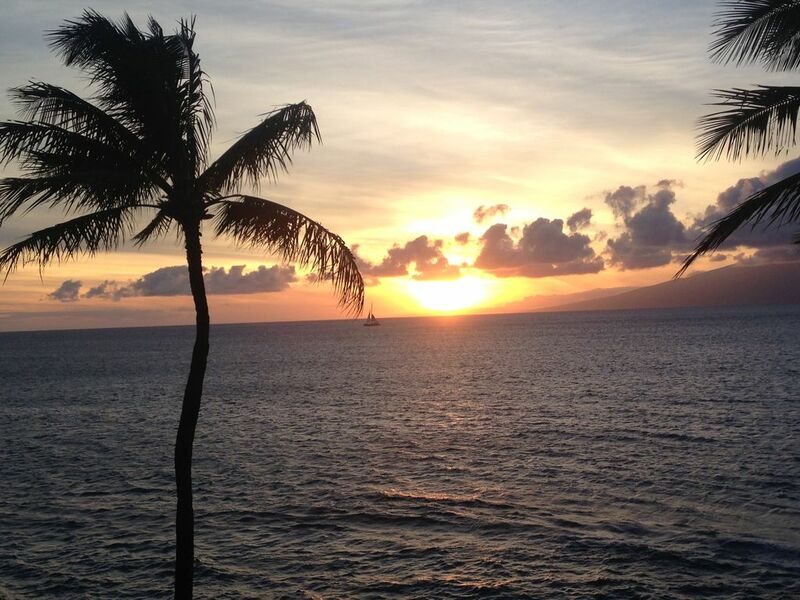 Enjoy Maui’s famous sunset from the comfort of your very own private lanai. The Papakea Resort has so much to offer its guests: outdoor shuffleboard, tennis courts, an 18-hole putting green, two pools, two large hot tubs, 12+ BBQ’s, etc. Not to mention, if you like to get up to see Maui’s beautiful sunrise, you can put your toes in the water and enjoy a walk along the reef that sits in front of this condo. We take great pride in our second home in Maui, and look forward to sharing it and its many beauties with you. Guest will be responsible for $17.00 per day, resort fee. The resort fee is only charged for a maximum of 10 days. If your stay is longer than 10 days, you will not be charged a resort fee for any days that exceed the day maximum. Indoor dining table, or also, enjoy Maui's breathtaking sunset on our private outdoor patio table. My main priority in booking was an amazing view to whale watch from the lanai, with a good location in West Maui- this was both. The view was amazing and we loved drinking coffee in the morning while watching the whales and having dinner while watching the sunset. The park was nearby with a sandy beach for kids. The condo was clean and had all of the little things you often have to buy (aloe, salt and pepper, etc.) I really appreciated that the cleaning staff didn't remove all of these little items, as often happens at other condos- we used several and purchased a few things we left for others to use. Beach chairs, boogie board, and the wagon were so helpful! The pool was great for the kids- found mai tai hour a couple of times! Parking is difficult if you return in the evening, but there is a place to drop people and bags if there isn't any spots near the building. The shower latch needs replaced as the door doesn't stay fully shut and could use some new pillows with fluff as the current pillows are pretty flat, but minor things. We will definitely stay here again. My condo was incredible, very cozy and comfortable all the comforts of home. The ocean view was impeccable, only downsize is there wasn't assigned parking so if your out and about and come home after sight seeing or shopping in evening you'll have to park a ways away from your unit a little tiring after a busy day and driving around Maui and carrying belongings down to the building your staying in . I wrote in my comments in the log in the condo. Excelent condo. Wonderful location. The location was perfect. Easy to get to beach as well as the pools. The grounds are clean well taken care of, all of the employees were professional and understanding and answered all questions. High lights, grandson learned to boogie board, granddaughter built sand castles. Every other night meat cooked on the BBQ. A real family vacation. Hope to retutn one day soon. This is by far the best unit at Papakea. Everthing was exceptional from the oceanfront view, the furnishings, the well-stocked kitchen and all the amenities needed to enjoy the sand and surf. Will definitely search out this unit again next time we visit Maui.